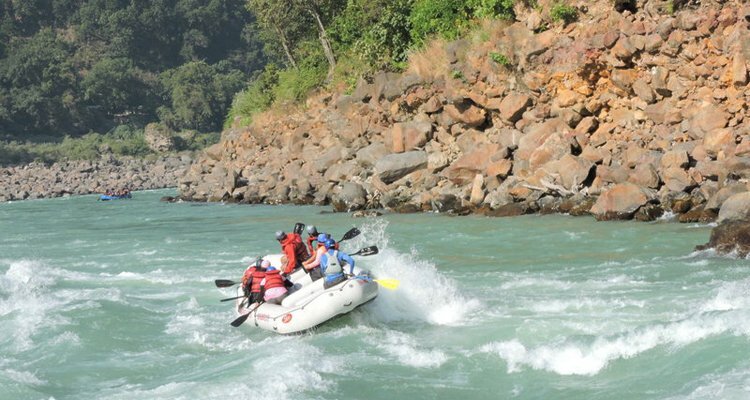 Haridwar and Rishikesh same day trip is a blend of adventure and religious tour. Enjoy and explore Haridwar and Rishikesh with the Holy River Ganga. The holy city of Haridwar is located in the north Indian state of Uttaranchal at a distance of 214 km from Delhi and Rishikesh is located in the northern part of Uttaranachal. 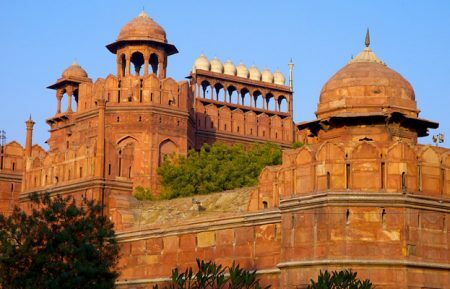 It is 238 km northeast of Delhi and 24 km north of Haridwar and spreads on the right banks of the Ganges. 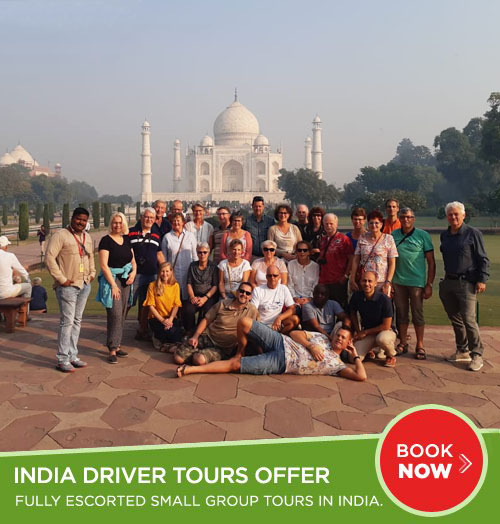 Our english speaking driver will pick you up and head for Haridwar, which is about a 4 hour drive. The holy city of Haridwar is located in the north Indian state of Uttaranchal at a distance of 214 kms from Delhi. 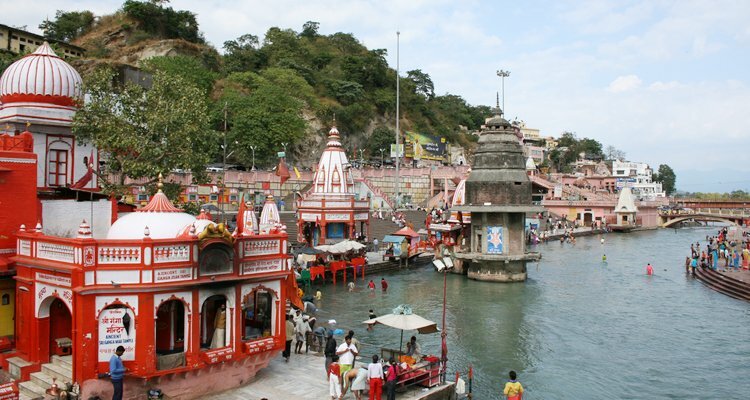 Har-ki-Pauri: Holy ghats are named after the Charan (Footprints) of Hari (God Vishnu) impressed on a stone, set into the upper wall of the ghats. 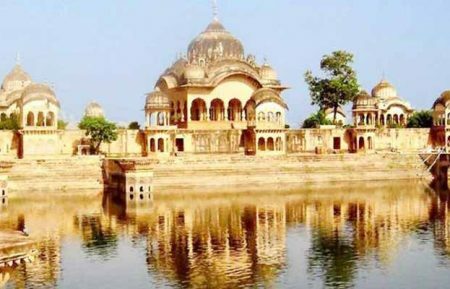 Constructed by King Vikramaditya in memory of his brother Bhartrihari, it is thought that Bhartihari eventually came to Haridwar, to meditate by the banks of the holy Ganga. 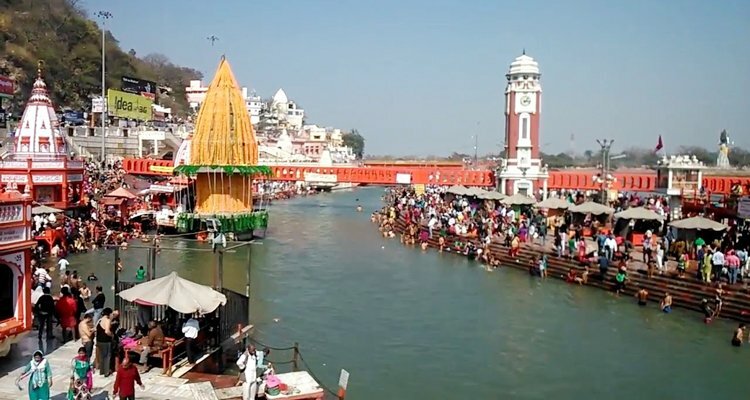 When he died, his brother constructed the Ghat in his name, which later came to be famous as Har-Ki-Pauri. This sacred bathing ghat, is also famous as Brahmakund. The reflection of golden hues of floral diyas, in the river Ganga, is the most delightful sight in the twilight, throughout the Ganga Arti Ceremony. It is the most important ghat on the river Ganga, where a holy dip is a must for every devotee. Mansa Devi Temple: One of the most visited temples in Haridwar, Mansa Devi Mandir occupies a place on top of the Shivalik hills. The temple is dedicated to Goddess Mansa Devi, believed to fulfill the wishes of those who visit here. It is a tradition with the devotees to tie sacred threads around the tree that stands within the premises of the Mansa Devi temple. From the temple, one can have heart stirring views of the Haridwar town. Along with Chandi Devi temple and the Maya Devi temple, it completes the Siddhapeeth Triangle. Daksha Mahadev Temple: As per the ancient hindu mythology, this temple is supposed to have been the site of a yagya (ritual) conducted by Daksha. This ancient shrine, located in Kankhal town which is 4 k.m. from Haridwar. Sati Kund: This is the holy place where the wife of Lord Shiva, Mata Sati is believed to have done the ritual of self-immolation. The ghat here is thus famous today as Sati Kund. The Triveni Ghat: It is one of the most prominent bathing ghat in Rishikesh. With its modern images of Hindu deities and white sandy beach, the ghat is ideal for a dip in the holy waters of the Ganga. The evening, arati (worship) with lamps is worth watching. Bharat Mandir: The Bharat Mandir near Triveni Ghat is esteemed to be the oldest temple in Rishikesh. The temple's presiding deity is a black stone Vishnu, which is considered to be blessed by Adi Shankaracharya while his visit to Rishikesh in the 9th century. This occasion is marked with special celebrations on the day of spring festival, Basant Panchami. 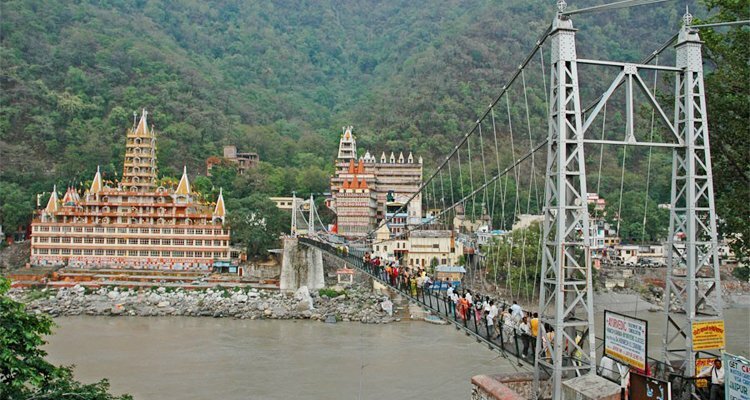 Lakshman Jhula: Lakshman Jhula is basically a hanging bridge on the Ganges and the most popular spot in Rishikesh. 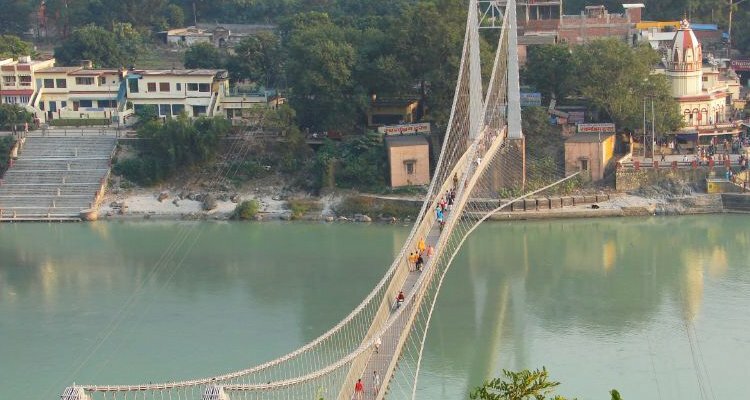 About 2 kms upstream is the old footbridge called Lakshmanjhula, named after the brother of Lord Rama. Temples line both sides of the river at Lakshmanjhula. Swarg Ashram: With its numerous ashrams, food stalls and shops, this ashram is a haunt for those looking for insights into religious themes.Important shrines and ashrams at Swarg Ashram include Kali Kumbliwale founded by Swami Vishudhananda, Parmarth Niketan with large statues of gods and goddesses and the Gita Bhavan with its Ayurvedic dispensary. In the evening during sunset, you will visit Ganga Aarti at Haridwar. Thousands of sects visit the ghats of the Ganga at Har ki Pauri at Haridwar to witness the aarti that started several decades ago. The tradition continues unabated and is a sight to behold. It takes place on the other side of the banks where you will see the priests light up the lamps in a clockwise manner, accompanied by songs in praise of Mother Ganga. After the ritual is complete, devotees will cup their hands over the flame and raise their palms to their forehead in order to get the Goddess's purification and blessing. Finally, head back to New Delhi and get dropped at your hotel at around 10pm. 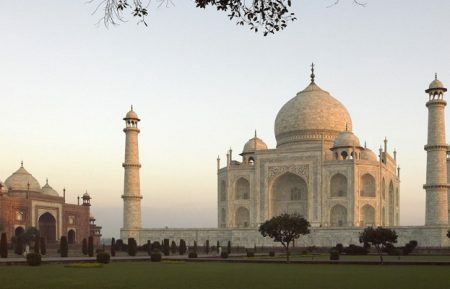 Major sightseeing places to visit in Haridwar. Enjoy Ganga Aarti ceremonies do visit Har Ki Pauri Ghat. 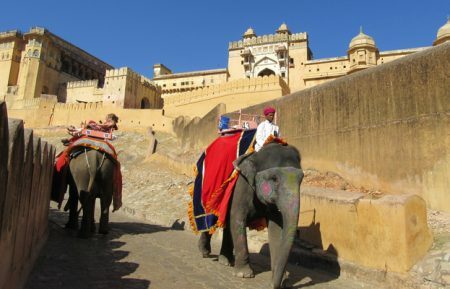 Visit major attractions in Rishikesh.